Let's start 2018 with some ideas for being more efficient in the kitchen. I don't know about you, but I am always grateful for any suggestions that will save me time, money, or both in my kitchen. I've been gathering these kitchen tips over the years and use them all in my own kitchen. How many do you use, too? 1. Any flat plastic lid with a rim makes a handy chopping surface. Be on the lookout for plastic, food-safe storage containers from your weekly grocery purchases. It will protect your counter, keep small items likes olives and cherry tomatoes from rolling away from you, and control the juicy mess from cutting your vegetables. I love this tip for keeping acidity juices from lemons and limes off my shiny granite. 2. Use two-same sized lids to cut small, round fruits and vegetables like olives, cherry tomatoes, and grapes in half. Place the items to be cut on one of the lids. Then, place the second lid on top, sandwiching the vegetables between the two lids. Using a sharp, long-bladed knife, run the knife horizontally between the two lids, holding the top lid down tight. Voila! Your fruits and vegetables can be cut in half with one swipe of the knife! 3. Do you want vegetable ribbons? There’s no need to buy a fancy tool for the task. Just use a vegetable peeler to make thin ribbons from vegetables like zucchini, radishes, and carrots. 4. Use your kitchen shears to cut chives, green onions, and many herbs. You’ll find it to be easier than using a knife and the snip of yours scissors won’t bruise tender greens. 5. Wash parsley, cilantro, chives, and scallions as soon as you bring them home. Pat them dry with a kitchen towel. Wrap them individually in a paper towel and insert them (wrapped in the paper towel) into a plastic zip closure bag. They’ll keep for a week or more in your refrigerator. I do this all the time with great success! 6. Don’t refrigerate basil. Basil is sensitive to the cold. Rinse your basil in room temperature water and place the stems in a glass filled with water. Cover the entire bunch of basil and the glass with a plastic bag and keep it on your kitchen counter. The plastic bag will create a greenhouse effect. Just snip what you need when you need it. Change the water every couple of days. 7. Kitchen shears aren’t just for herbs and vegetables. Raw meats can be slippery and hard to cut with a knife. Use kitchen shears to cut boneless chicken breasts into nuggets or to cut pieces of beef into cubes for soups. 8. Don’t buy cheap knives. Treat knives as an investment. Buy one good paring knife and one good all-purpose knife. I like a santoku knife as my all-purpose knife. You’ll also want a knife sharpener. Inexpensive hand-held versions are readily available. These will last you a lifetime and save you money in the end. Remember a sharp knife is your best protection from cuts. 9. Use cutting boards to protect the surfaces in your kitchen. Wooden cutting boards will last a lifetime with a simple care routine. Using food-grade mineral oil, oil your boards once a day for the first week of ownership, once a week for the next month and once a month thereafter. This will keep your board looking beautiful and much easier to clean. 10. Clean stains on your wood and plastic cutting boards with a sprinkle of salt and a half a lemon. Rub the lemon over the salt on the surface of your board. This will remove stains and make your board smell fresh and clean. 11. Keep salt flowing from a salt shaker by adding uncooked rice to your shaker. The rice will absorb humidity and keep the salt from clumping. 12. Did you break a glass on the floor? After picking up the large pieces, use a damp paper towel to capture the tiny shards. This may be more effective than sweeping or vacuuming. 13. Need to soften brown sugar that is as hard as a rock? Dampen a paper towel and place it on top of the sugar in a covered bowl. Leave it for several hours, or overnight. You’ll find it easy to break apart the sugar afterward. Keep your brown sugar soft by keeping a few marshmallows in the storage container with the brown sugar. 14. Place a wooden spoon across the top of a pot to keep it from boiling over. I do this all the time, too! 15. This is a great tip for backyard vegetable gardeners like me. Eggshells, coffee grounds, and the peels of vegetables and fruits make a great natural compost for the garden. You’ll need to compost for several months before using them, so think about where you might set aside space for composting. You’ll increase your garden’s output and save money on fertilizer. 16. Freeze grapes, raspberries, and blueberries. Add them to wine or cocktails as ice cubes, and when they get warm, they don't dilute your drink and they look attractive in the glass. 17. Freeze your candles before you use them the first time. They will burn more slowly and evenly than a candle that has never been frozen. If you happen to get candle wax stuck in a votive holder, place the holder in the freezer for a few hours. The wax will pop right out. 18. Do you have food stuck to the bottom of a pan? While the pan is still hot, add a little baking soda and water to the pan. Heat the pan to warm the water and baking soda. Pour the water and baking soda out of the pan and the pan should clean up easily. Also, try mix vinegar and baking soda together and let it bubble in the bottom of the pan. Pour the vinegar and baking soda out of the pan and you should be able to scrub the stuck on contents easily. 19. Don't store apples, onions, or potatoes together. The gases they emit are not compatible. 20. Freeze your ripe bananas for use in baking or smoothies. Peel them and wrap them individually in plastic wrap. Store them in a zip closure bag in your freezer. 21. Place a few slices of apple in the storage container to help keep the cookies soft. 22. An open box of baking soda in your refrigerator will keep the air in the fridge fresh and odor free. Remember to change it out regularly. 23. Freeze leftover coffee into cubes. Store the coffee cubes in your freezer to use in ice coffee or to make frozen mocha drinks. 24. Lettuce and baby carrots will last longer if you remove them from their packaging and store them with a paper towel to absorb moisture. Keep them in an airtight container or a zip closure bag. 25. Use the thin strip of plastic that you cut off the top of frozen vegetable bags as the tie to reclose the bag. It works! 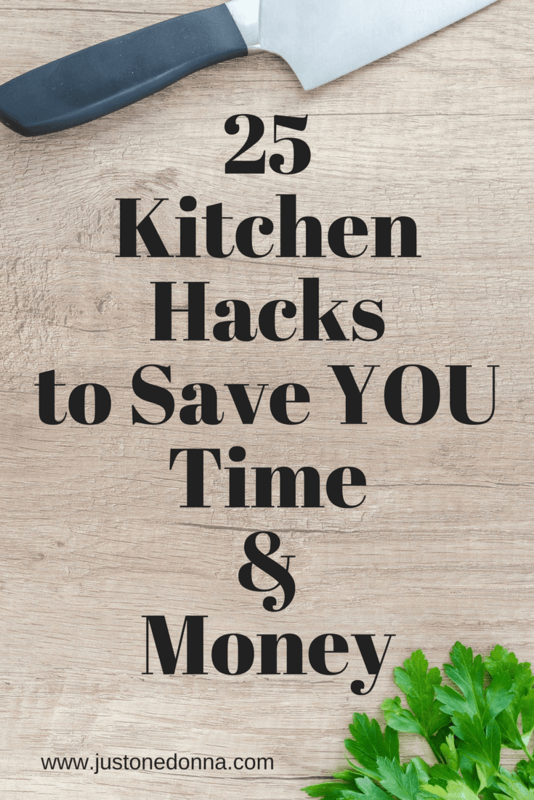 How do you save time and money in your kitchen? Share your favorite kitchen hacks with me.